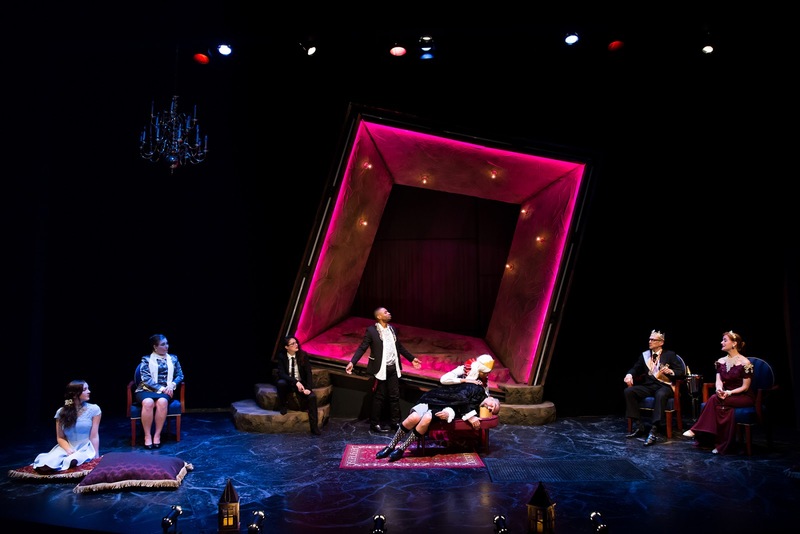 The Guthrie is currently staging a fantastic production of Romeo and Juliet, and now, across the river, Park Square Theatre brings us an equally fantastic production of Shakespeare's other most popular and produced play, Hamlet. The two make a nice pairing; both are youthful and modern with fantastically talented and energetic casts. This Hamlet, adapted, directed, and designed by Joel Sass, features a condensed cast of just nine, some gender-swapping (which provides more roles for women in male-heavy Shakespeare plays), and what I would call a breakout performance by Kory LaQuess Pullam in the title role, except that he's been breaking out for a couple of years in #TCTheater. Last year the Twin Cities Theater Bloggers chose him as our favorite new artists/one to watch (a choice he's continually reaffirmed this year), and the StarTribune recently called him "the fastest rising prince of Twin Cities theater." If you're not yet aware of Kory's work, as an actor on various stages around town, as a playwright and artistic director of Underdog Theatre, or as a founder and improviser with Blackout Improv, you will be now. He leads a talented ensemble in an interesting and inventive new production of one of Shakespeare's best. 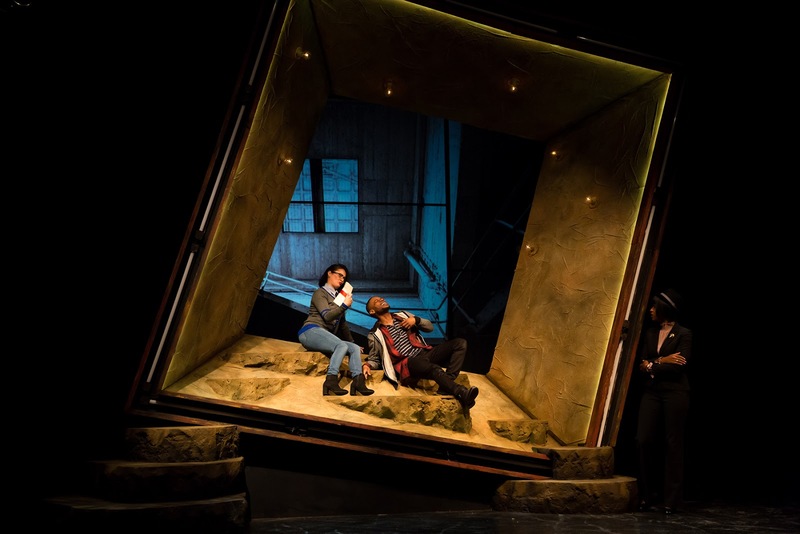 The moment the curtain opens to reveal a huge askew cube onstage (and not much else), you know you're in for a different kind of Hamlet. Joel Sass has reduced the typical cast of 20+ down to just nine with double casting and elimination of minor characters (the most notable and unfortunate omission being the comedy duo of Rosencrantz and Guildenstern, who are not only dead in this version, but nonexistent). Hamlet's school chum Horatio is now a woman, and Ophelia and Laertes' father Polonius is now their mother Polonia. Other inventive aspects of this adaptation are the use of close up video images of characters reciting some of the lines, the placement of the "to be or not to be speech" in an unexpected place, and echoing recorded voices used for King Hamlet's ghost and some off-stage dialogue. But don't worry, it's still the same story of a grieving young man who plans revenge on his uncle, who killed his father and married his mother, taking his place as King of Denmark. 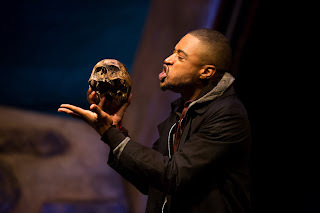 Kory is one of the best Hamlets I've seen (and it must be noted, the first African American Hamlet I've seen). He speaks the Shakespearean language so clearly and understandably; he feels every word and makes that feeling known. At times downcast and grieving, at other times wild-eyed and mad, at still other times determined to achieve justice for his slain father, no matter the cost. He delivers these lines, so familiar I could almost recite them myself, in a way that sounds new and revelatory. And his death scene is really quite something to see. The rest is silence. The other highlight in the cast is a young woman we've all watched grow up on the Children's Theatre stage, Maeve Coleen Moynihan. She fully embraces Ophelia's madness upon the death of her mother, and becomes a broken and fragile thing, softly singing her lament, then exploding into some nonsensical cry. 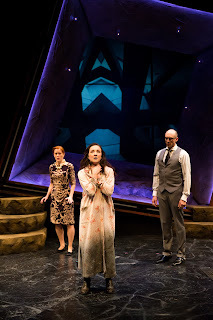 The rest of the ensemble is strong as well, particularly the two women who make these traditionally male roles their own - Kathryn Fumie as Horatio (who probably not coincidentally played Hamlet herself in Theater Unbound's all-female production a few years ago) and Tinne Rosenmeier as Polonia. Also great are Charles Hubbell as the murderous Claudius, Sandra Struthers as Queen Gertrude, and Wesley Mouri, Charles Numrich, and Imani Vaughn-Jones in multiple roles, with honorable mention for creepy voice of Theo Langason as the ghost. 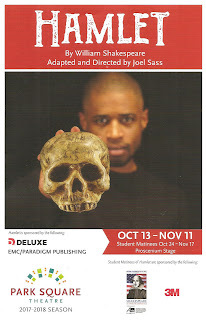 In a note in the program, Artistic Director Richard Cook explains that the nontraditional casting "opens minds and emotional doors - we know that when a student sees herself/himself on stage - through their own race or gender - they can personally engage and claim ownership of the play; this is 'access' at its essence." Kudos to Park Square for accomplishing representation on stage in a way that feels real, organic, and compelling. A few more words about Joel Sass' set, which is dominated by the three-dimensional cube that characters walk through or hang out on. It's slanted and askew, cueing us in immediately to the fact that something is off here, "there's something rotten in the state of Denmark." Video images are projected behind the cube, hinting at location or adding mood to the scene, while the lights around the cube flash with drama. 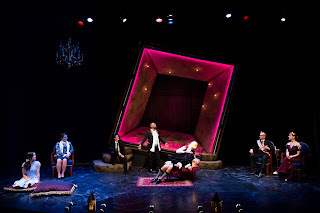 Characters are dressed in modern clothing, helping to make this Hamlet not simply a relic of the past (video designed by Kathy Maxwell, lighting designed by Michael P. Kittel, costumes designed by Alice Fredrickson). 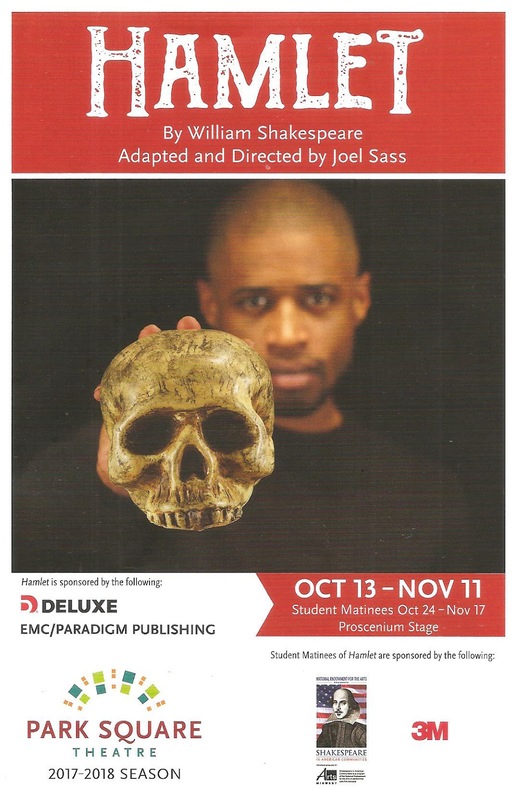 Park Square's Joel Sass' William Shakespeare's Hamlet includes lots of cool and inventive things, which may or may not be successful to each audience member depending on taste. But I always applaud taking risks and doing things differently than they've been done before, even if they don't always work. And for me, it worked. Add to that a fantastic cast breathing life into Shakespeare's most quotable play, and this is a Hamlet not to be missed. Continuing through November 11 (helpful tip - check out both the Xcel Energy Center event schedule as well as the schedule at the new Palace Theatre across the street when planning parking and transportation).